Gregorian leap day is a simple enough concept: the earth takes about 365 days and six hours to make a full revolution around the sun. Rather than starting our year a quarter of the way through the 366th day every year, we even out by adding a day every fourth year. Leap day generally comes and goes with little or no fanfare, save the occasional TV special and last-minute schedule adjustments when you realize that this year has that extra day. Leap day hasn’t always been a given, though, since the Gregorian calendar hasn’t always been a given. Implimented by a 1582 Papal bull as a reform to the Julian Calendar, it wasn’t adopted by Britain until 170 years later. Those largely Protestant nation-states in Europe took umbrage to a Catholic calendar, and some took over a century to warm up to the idea. Three years after the dissolution of the Ottoman Empire, Turkey became the final country to implement the Gregorian calendar. A calendar does more than measure our position in relation to the cosmos — it has to do more, since the cosmos are awfully remote. Signposts within the year — holidays, anniversaries — help us tether our lives to a larger temporal framework. It’s effectively a kind of assimilation, taking on the calendar of another culture. From one person to entire religions, we distinguish ourselves by the ways we mark time. Occasionally, groups will reject the Gregorian calendar outright as an act of liberation or rebellion — both the French Revolution and the Paris Commune broke with the Gregorian calendar in favor of the French Republican Calendar, comprised of twelve 30-day months and five national holidays at the end of the cycle (six days in the event of a leap year). The first time this calendar was implemented, it lasted twelve years. Its implementation in 1871 lasted 18 days. It’s both curious and telling that the U.S. didn’t attempt any calendar reforms during its revolution. In a grotesque analog to this kind of calendarial iconoclasm, the U.S. and Canada (ONAN) in David Foster Wallace’s Infinite Jest operate on subsidized time, in which each year is sponsored by a product (e.g., Year of the Whopper, Year of the Depend Adult Undergarment, Year of Glad). Heavy-handed as it is, it’s a brilliant illustration of the triumph of rugged individualism and corporate/capitalistic gain over matters spiritual, etc. Symmetry 454, which was not invented by a machine. It was proposed by Dr. Irv Bromberg, calendar reformer by day, bad pun-er by night. February, May, August, and November would all have 35 days, which is a total bummer since February is perennially awful. In leap years, which occur every five or six years, December also has 35 days. All the rest of the months have 28 days. Advantages to this calendar: consistency, and no Friday the 13ths. According to Bromberg, “many people are superstitious about bad luck occurring on Friday the 13th.” To avoid the problem, it might make more sense to avoid 13s in months altogether, the way buildings do. But then when we’d reintroduce those days every leap year, we’d be entering a world of pain. Positivist Calendar, proposed by August Comte in 1849. Again, we have a 13-month calendar where each month is 28 days, but leap years occur every four years as in the Gregorian Calendar. Months had names like Homer, Moses, Shakespeare, and Gutenberg. None of the months were named after women. The Simpsons Calendar, proposed by Matt Groening. It’s essentially the Gregorian calendar, but with a leap month, Smarch, added at will. 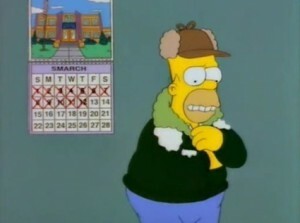 Smarch (as in “beware the Ides of Smarch”) generally occurs after December. Again, showing little regard for drifting away from Earth’s true solar path w/r/t 24-hour days. The Garfield Calendar, proposed by Jim Davis. Each year would consist of twelve thirty-day months. Each week would be six days long, and would begin on a Tuesday. A thirty-day leap month would happen every six years. Overall, though, at this point it’d be tough to make a complete switch from the Gregorian calendar. It’s become a matter of convenience, not one of politics. And it’s been so long that the calendar itself has become secularized. Either way, it might be tough to get used to Smarch coming in like a lion.